Walid Raad and the Vanishing Museum. The importance of social media for distributing art and connecting communities. Deb Sokolow, Whatever happened to the Pentagon (restaurant)? 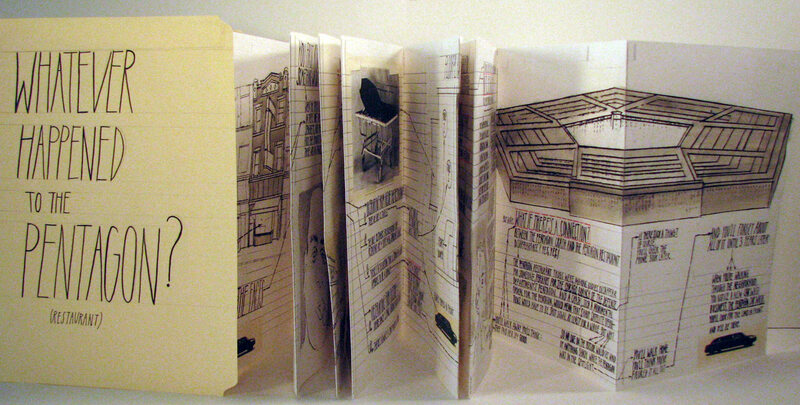 (2007), photocopied, hand-colored, accordion-folded paper, bound in manila file folder, approx. 11 1/2 × 9 1/2 inches (closed). Edition of 100. Published by the artist. The relationship between comics and the art world is complicated and (at least for comics artists and audiences) emotionally fraught. While serialized word-picture combinations go back to ancient Egypt at least, the American strain of the sequential, narrative, printed graphic form we call “comics” arose about a century ago as a feature of the new Sunday newspaper supplements.3 When cheap pamphlet reissues of these strips proved popular, publishers began commissioning “comic books” with original content, and to make the most of the low-quality lithographic printing processes used, a graphic style of strong black outlines and flat areas of dot-screened color evolved.4 Though newspaper comics were generally the work of single creators, comic books were usually assembly-line products, made by teams of writers, pencillers, inkers and colorists (this remains standard practice with mainstream commercial publishers like DC and Marvel). In the mid-20th century, the sensationalism of comic books and their popularity with young readers prompted assertions of a link between comics and juvenile delinquency, leading to the self-censoring Comics Code Authority, adopted in 1954 (now largely abandoned). The emergence of underground comics in the 1960s solidified the reputation of comics as a site of countercultural rebellion. Artists such as R. Crumb, Jay Lynch and Gilbert Shelton detailed the sexual and druglaced adventures of their characters but also delved into politics and subverted older comics styles. By the 1980s, when Françoise Mouly and Art Spiegelman began publishing the pioneering anthology RAW, comics had evolved to include artists like Gary Panter and Jerry Moriarty, who explore complex subjects in experimental formats. Gabrielle Bell, pages 83 and 87 from “The Artist’s Assistant” in Lucky (2006), offset-printed hardcover book, 9 1/4 × 7 1/4 inches. Published by Drawn & Quarterly, Montreal, Canada. Beginning with Roy Lichtenstein’s appropriation of Mickey Mouse from a Little Golden Book (Look Mickey (1961)),5 the famous characters, characteristic visual style (black outlines and flat areas of color) and narrative devices (sequential panels, speech bubbles) of comics were gleefully exploited by Pop Art. A half-century later comics are still frequently quoted in contemporary art: Sue Williams improvises on shapes and forms derived from sources such as Don Martin’s comics in MAD; Gary Simmons makes use of racially loaded Disney characters, drawing then erasing them to leave smudged, semi-legible traces; Rivane Neuenschwander has whited (and redded and greened) out the contents of panels, narration boxes and speech bubbles from a Brazilian Disney comic book. With some notable exceptions—Ida Applebroog, Öyvind Fahlström, Jess and Mike Kelley, among others—painters have tended to focus on the stereotypical visual properties of comics. This narrow approach to comics is mirrored in an art discourse that concentrates on the look of comics, rather than the functions of narrative, representation and sequence on which comics are built. Scholars, curators and critics often use the terms “cartoon” and “comics” as if they were specific visual descriptors rather than media that encompass many styles6 and that today incorporate narrative genres (autobiography, science fiction, journalism), poetry and non-narrative abstraction. The continuing critical view of comics as “raw material” for real art7 betrays a monolithic and ahistorical conception of the medium, ignoring its aesthetic development and bypassing alternative comics altogether—the comics that could most easily be recognized as fine art. Frank Santoro, pages 27 and 28 from Pompeii (2012), risograph-printed softcover book, 10 7/8 × 8 3/8 inches. Edition of 300. Published by PictureBox, Brooklyn, NY. Frank Santoro, pages 10 and 11 from Pompeii (2012), risograph-printed softcover book, 10 7/8 × 8 3/8 inches. Edition of 300. Published by PictureBox, Brooklyn, NY. 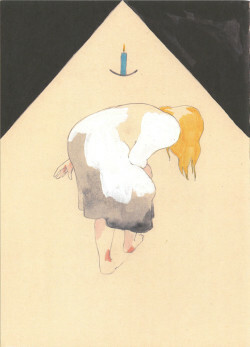 Aidan Koch, page 46 from The Blonde Woman (2012), offset-printed softcover book, 9 × 6 1/2 inches. Edition of 500. Published by the artist. 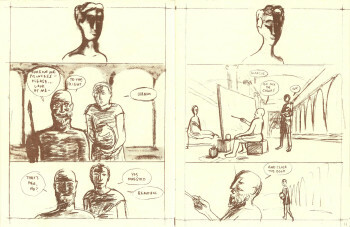 The first issue of Frank Santoro’s series Pompeii (2012) also revolves around an artist’s assistant: Marcus, who works for the artist Flavius in the ancient Roman city. The plot revolves around their efforts to keep Flavius’ regular model and lover from finding out about his newest lover, a princess. Santoro was trained as a painter and draws from both classic comics and Classical art. Like his earlier Storeyville (1995, repr. 2007), which eschewed “deliberative naturalistic clarity” to evoke subjective experience through expressive drawing,15 Pompeii reinforces thematic content through visual style, carefully deployed proportion and dynamic symmetry.16 The cover features a portrait bust of Marcus on the front and of Flavius on the back, each placed within the intersection of two circles, suggesting ancient geometric constructions like the Golden Rectangle. This iconography of composition, proportion and design fits the story and also emphasizes the axioms that underlie both art and comics. Cartoonists sometimes see themselves as the last champions of representational and compositional skills in the face of an art world that no longer values these abilities.17 Santoro’s book is a story about painting, told through the medium of comics, and it repeatedly presents comics and painting as each other’s double. At one point Flavius asks Marcus whether the eyes in his portrait of the princess are correct, and mirrored panels on the following spread show two pictures of the princess, identical but for the blinking eyes on the right. It is unclear which image represents Flavius’ painting and which the real woman. Comics and painting both depict the world, and sometimes each other, and they use the same tools to do so. Aidan Koch does not tell stories about the art/comics relationship, but her work enacts it, melding comics’ storytelling formats with abstraction and experimental composition. 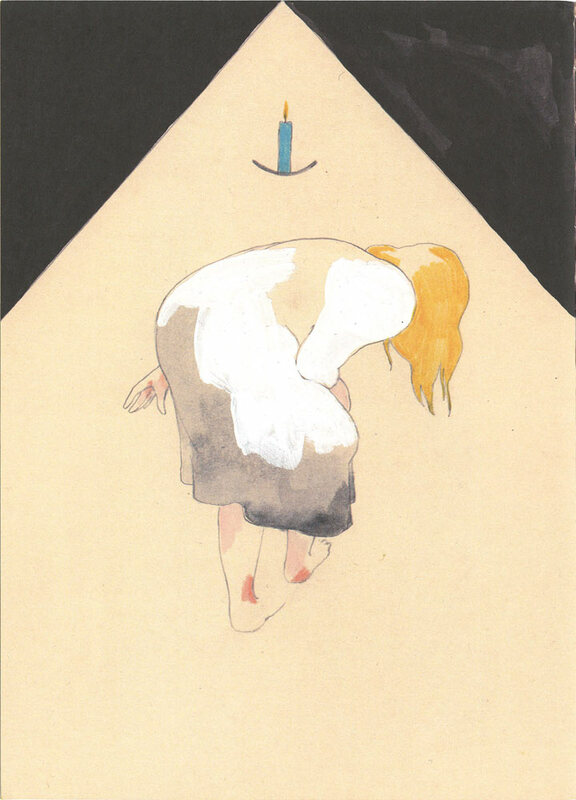 On one page of The Blonde Woman (2012), a hunched figure squeezes between two heavy black triangles that press in from the upper corners. Above her hovers a lit blue candle in a curved, parenthesis-like holder. 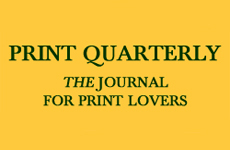 Commercial offset printing is now adept enough to convey faithfully the fine, restrained pencil line and delicately applied gouache and watercolor that delineate the figure and candle. Seemingly deliberate gaps interrupt both line and color, and the brush strokes are nearly as prominent as the dress and figure they describe. The overall effect is mysterious and a bit melancholy. 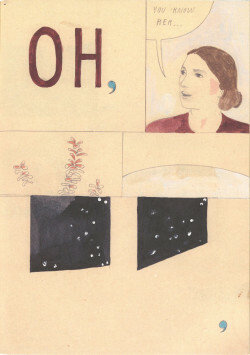 Aidan Koch, page 17 from The Blonde Woman (2012), offset-printed softcover book, 9 × 6 1/2 in. Edition of 500. Published by the artist. Koch is part of what critic Rob Clough has dubbed the “immersive” movement of comics, which produces work that possesses “a unity between word and image, where text has a visual or decorative impact and is fully integrated as part of the art.”23 These are comics to be both read and viewed, or more accurately, to be read through viewing. Immersive artists include, among others, English, Dunja Jankovic, Juliacks, Blaise Larmee, Ron Regé, Jr. (especially in his recent work) and a number of Francophone, German and Scandinavian cartoonists such as Clara Besijelle, Frédéric Coché, Julie Delporte, Anke Feuchtenberger, Dominique Goblet, Joanna Hellgren, Emilie Östergren and Amanda Vähämäki. Other groups have also worked to expand the standard vocabulary of comics. Artists associated with the Fort Thunder collective in Providence, Rhode Island, and anthology Paper Rodeo breached the art/ comics wall with their influential comicsinfused screenprints. 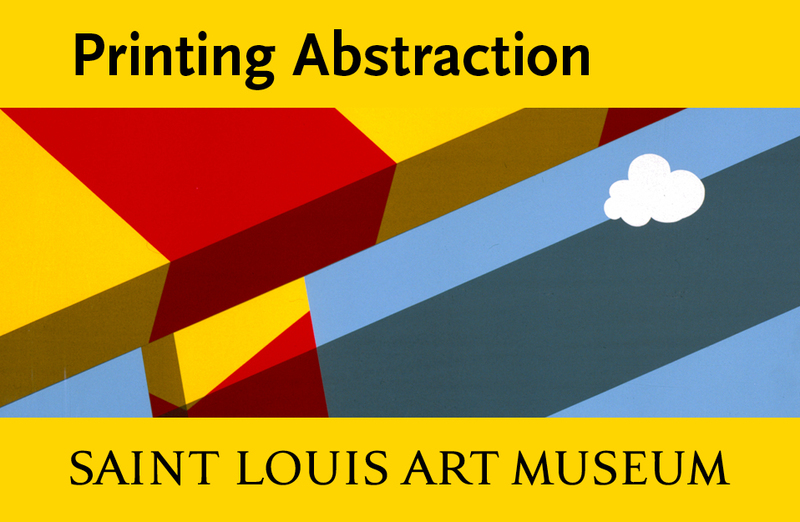 Matt Brinkman, Jo Dery and Leif Goldberg exploited the flat color shapes, sharp edges and high contrast of screenprint in prints and books. Anya Davidson, Edie Fake and Lilli Carré produce limited-edition publications that are as much like artists’ books as like mini-comics; and cartoonist Julie Doucet now makes artists’ books and prints almost exclusively. Derik Badman, Andy Burkholder, Warren Craghead III and Leslie Wiebler are among those investigating comics’ potential for abstraction, treating historic styles and conventions like panels and speech bubbles as objects of inherent aesthetic interest. All recognize the newly central role of visuality in comics and have created works that cross into the realm of fine art. 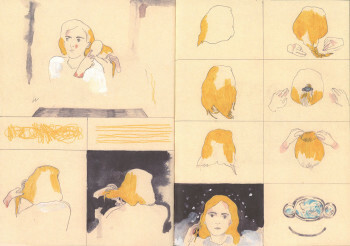 Aidan Koch, pages 8 and 9 from The Blonde Woman (2012), offset-printed softcover book, 9 × 6 1/2 inches. Edition of 500. Published by the artist. Unifying this output is a self-aware investigation of the structural features of comics (mark-making, print quality, codex form and visual conventions) that connects with the meta-critical sensibility of contemporary art. In particular, the domains of comics and of artists’ books are becoming increasingly hard to distinguish. Edie Fake recently received an award from Printed Matter, and cartoonists have begun to exhibit at the New York Art Book Fair. 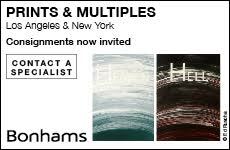 Nearly all have adopted the “original print” practice of producing work in signed and numbered limited editions. 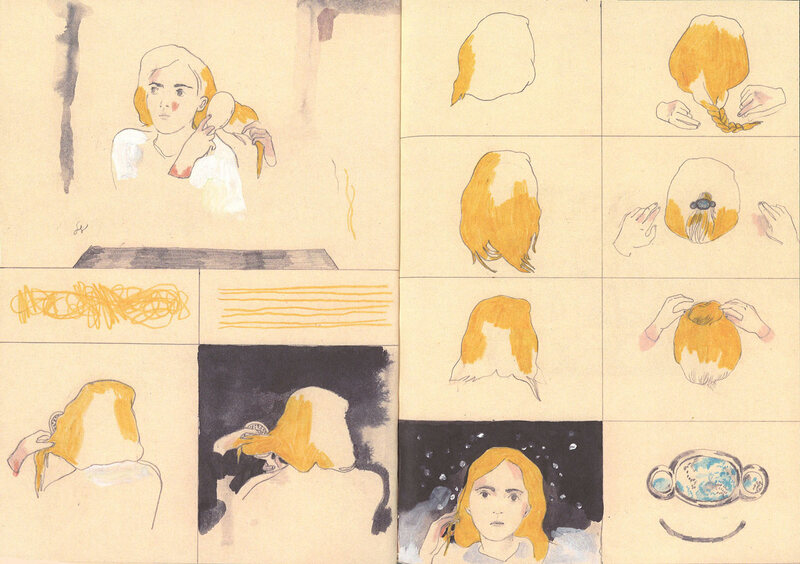 Elements of comics are also creeping into painting, drawing and installation art. Deb Sokolow, for example, relies on comics-like modes of integrating text and picture, building them into sequences and moving viewers through narratives. 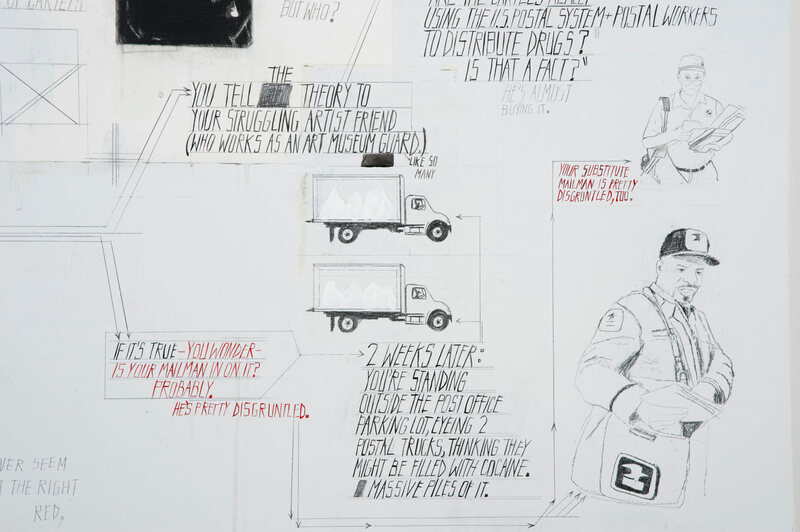 Her large, site-specific wall drawings and accordion-folded books use images, texts, charts and diagrams to map the paranoid thoughts of an unnamed character in the second person: “YOU WONDER IS YOUR MAILMAN IN ON IT? PROBABLY. HE’S PRETTY DISGRUNTLED,” reads a passage in the wall drawing You tell people you’re working really hard on things these days (2010). On the wall or on the page, her stories develop in installments laid out as a sequence of physical spaces. Sokolow believes the “generation of [Dan] Graham and Richard Serra kind of poo-poo” such “illustrative tendencies.”24 Like the comics artists Bell and Santoro, she works through her feelings about this underdog status in the stories she tells. Another section of You tell people casts Richard Serra as a failed artist turned hit man and body butcher for the Chicago mob. 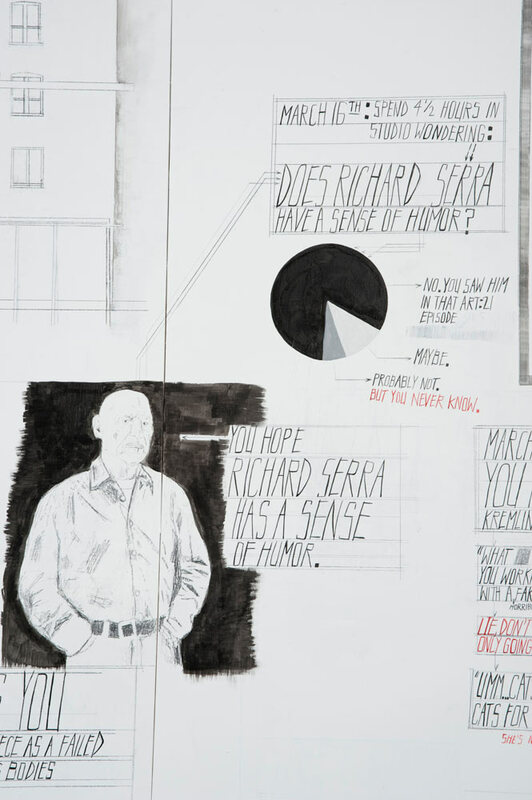 Arrows link a portrait of the sculptor to the question, “DOES RICHARD SERRA HAVE A SENSE OF HUMOR?” A pie chart below illustrates unfavorable odds. 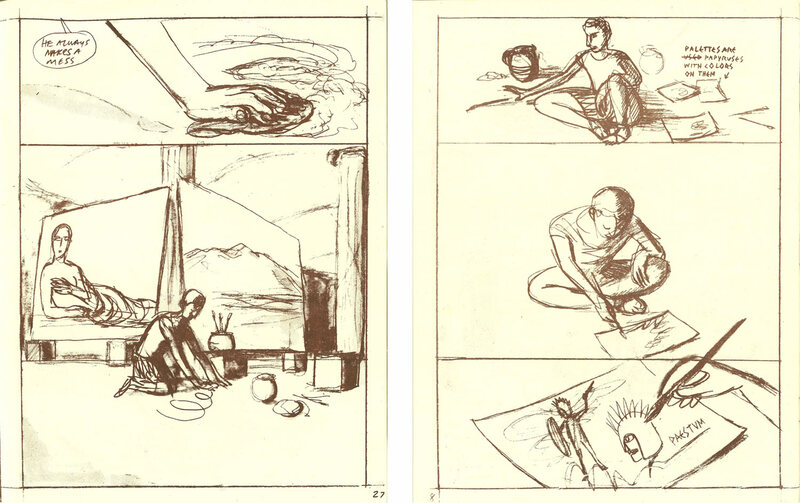 Sokolow’s images serve the story but, like many avant-garde comics artists, she rejects the term “illustration” and its implication of work done on spec rather than as a personal statement. While she doesn’t use panels or speech bubbles, her storytelling mix of all-caps text and figurative drawings follows the workings of comics—more obviously so than, say, Koch’s mood-driven work. Words caption and narrate pictures, pictures explain words, and each corroborates, complicates and contradicts the other. Many other contemporary artists have utilized the mechanics of comics in new ways. Martin Kippenberger’s and Raymond Pettibon’s work mimics clichés of how comics look, just as Pop Art does, but to tell stories, exploiting the sequencing of word and image (in Pettibon’s case, sometimes in book form) and using speech bubbles and visualized sound effects to structure that narrative. The Royal Art Lodge (including Michael Dumontier and Marcel Dzama) constructs meaning through picture and caption, but more critically, highlighting the sequential movement between them— the fact that both can’t be perceived at once. Kerry James Marshall actually makes comics, employing in his ongoing RYTHM MASTR series layouts and line work typical of contemporary superhero adventures. 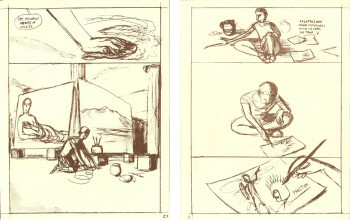 Comics and contemporary art are thus beginning to share some core characteristics: comic artists can be seen to be moving closer to the conceptual concerns of art as they engage in critical analyses of the traditions and materials they employ, while contemporary artists are adapting the structural elements and narrative functions of comics to (primarily unique) media like drawing and painting. But they do not yet occupy the same territory: Koch may think of herself as an “artist who uses comics,” but for Sokolow, comics and zines are a way “to broaden the narrowness of the High Art story”25—they remain a material form of the “other.” Similarly, while Kerry James Marshall may appear to be an art star “who sometimes chooses to use comics,” for him it remains a tool to investigate other issues, much as it was in Pop Art; despite actually being made in the comics form, the work does not engage the mechanics of comics in a meta-critical way. In sum, contemporary painters, sculptors and installation artists have not taken up comics in the way that, for example, the conceptual artists of the 1960s and 1970s took up photography. The audiences for comics and for art also remain, for the most part, two separate entities. Though comics can now be seen in numerous galleries, most are venues that specifically deal with the form. The interviews with Koch and Sokolow consulted for this article were both published online, but Koch’s appeared on such sites as The Comics Journal while Sokolow’s can be found through a link on PBS’s Art:21 blog. For their generosity in discussing many of the issues covered in this article, I thank Eugene Binder, Christa Donner, Abe Lampert, Amara Leipzig, Mark Pascale, Marshall Shord and Joe Tallarico.